In a stunning piece of news, reports are coming in from Italy that Pope Benedict is set to resign on February 28th. The 85 year old ‘God’s Rottweiler’ announced in Latin today that he had meditated deeply on this course of action and had agonized over the move, but was resolved to go at extraordinarily short notice. Once the Pope steps down, the position of pontiff will remain vacant until the consistory of cardinals select his successor in time honoured tradition. The Catholic church has suffered the pain of a thousand cuts over child abuse scandals all over the world, as more and more revelations in more and more countries have eroded their claims to moral sanctity and placed huge question marks over the church’s role in pastoral care. There can be no doubt that Benedict has lurched from crisis to crisis in his time as head of the church and that the stresses and thanklessness of trying to steer the church through these turbulent times has taken its toll. It is a highly unusual move for a sitting pontiff to resign his position. The last pope to voluntarily depart the office was Pope Gregory XII (1406–1415), who did so to end the Western Schism, which had reached the point where there were three claimants to the Papal throne. Even before that, examples of this surrender of power and status were limited to a handful of cases in the High Middle Ages. 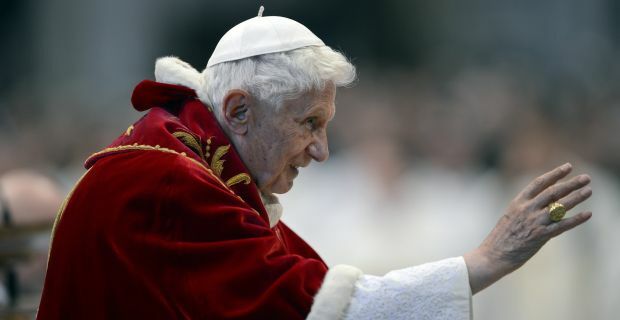 Details will doubtless continue to emerge about this shock decision, and it remains to be seen what kind of a leader the cardinals will choose to succeed the ultra conservative Benedict. The world is still reeling.